Carp are accused of creating many problems in our waterways. Carp are now the most abundant large freshwater fish in the Murray-Darling Basin and are the dominant fish species in many fish communities in south-eastern Australia. The species is widespread in rivers, lakes, dams and estuarine systems in Victoria, New South Wales, South Australia and the Australian Capital Territory. More limited populations occur in Queensland, Western Australia and Tasmania. Carp are responsible for increased water turbidity through their feeding behavior, which uproots aquatic plants and prevents reestablishment. Carp compete with native fish for food and habitat. Carp are long lived and prolific breeders. Male carp mature at 1-3 years while female carp mature at 2-4 years and may produce more than one million eggs per year. 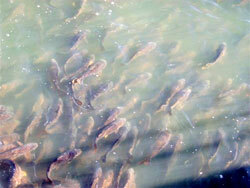 Carp can migrate at any time of year and spawning usually occurs in late spring or early summer. Females may spawn several times in one season. During the early 1960's evidence of ecosystem damage by carp in North America raised concerns about potential problems in Australian waters. Carp were subsequently declared noxious and an eradication program was undertaken by the Victorian Department of Fisheries and Wildlife to kill all carp in farm dams with poisons. Commercial carp fishing is one of the methods to help eradicate Carp at this stage. K&C Fisheries Gloabl Pty Ltd and other commercial fishers have been utilized for these operations because of the local knowledge and expertise. Carp thrive in disturbed river environments. Restoring the health of our aquatic ecosystems will contribute to addressing the carp problem. to the environment by way of less turbidity, increasing Photosynthesis, therefore greater plant life and improved ecology, the water is cleaner for human activity and improves water taste for stock. The carp industry doesn't only help the fisher and the environment, but is also a big help to the community and government. K&C Fisheries Gloabl Pty Ltd support up to 18 families directly and the rest of the industry could be supporting between 4 - 70 families directly. With industry earning $1.7m/year, this in turn is a benefit to the community with a value of approximately $5.1 million on a dry year.